“Bigger is better” remains almost unchallenged as the governing principle in most public education systems. Since the origins of state schooling in the mid-19th century, public education has been championed by a class of “educrats” firmly committed to the ideal of “progress and efficiency” and relentless in pursuit of school consolidation. In spite of periodic warnings by prominent education scholars such as Michael Katz (OISE and the University of Pennsylvania) and Bruce Curtis (Carleton University), the evolving system thrived on centralization, consolidation, and bureaucracy. Right from the beginning until today, the schoolhouse has been a contested terrain in an ongoing struggle over local education democracy as well as the goals and purposes of public schooling. Bureaucratization has been a relentless force transforming school communities into “systems” of schools. Education’s current rock star, Sir Ken Robinson, claims that we have essentially sold ourselves out to the “fast food” model in public education by embracing organizational efficiency, mass production, and uniformity. Everywhere you look, the march of urbanized, bureaucratic, centralized education is nearly complete, marking the highest stage of the modern bureaucratic education state. Today’s central administrative offices, layers of administration, “super-sized” elementary schools and “big box” high schools all testify to the dominance of the trend. Elected school boards, a last vestige of education democracy, are often considered nuisances and becoming a threatened species. Critics of educational bureaucracy and even quiet doubters are either ignored or dismissed as “turn-back-the-clockers” in our 21st century universe. Yet all is not lost. Local communities threatened with losing their rural community schools and urban neighbourhood schools have begun fighting back in a much more effective, coordinated fashion. 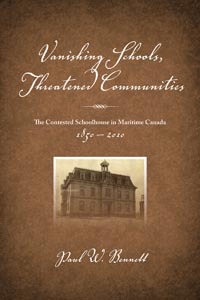 Right across Atlantic Canada, in the American Mid-West, and in places as disparate as Albany, New York, southwestern Ontario and mainland British Columbia, defenders of community schools are waging determined local battles because they steadfastly believe that older schools are worth fighting for. For a few “Save our School” groups, the fight is all about restoration and bringing older neighbourhoods or dying communities back to life. Some citizens’ groups simply want to save a piece of history, but most resist school closures because they also threaten the vitality of the local community.